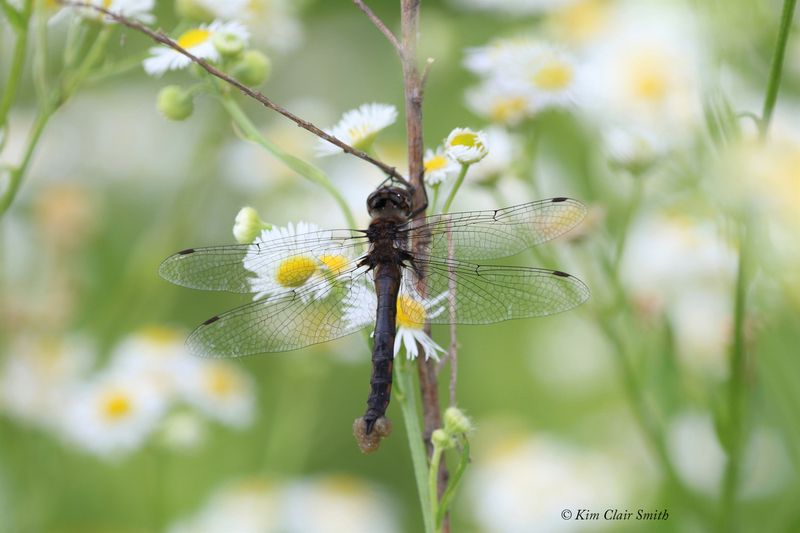 This past weekend was the long-awaited Odo-Con, the dragonfly conference of the Ohio Odonata Society. This was my second year to attend, and I was glad that this time I would know more people and not feel like such a newbie. 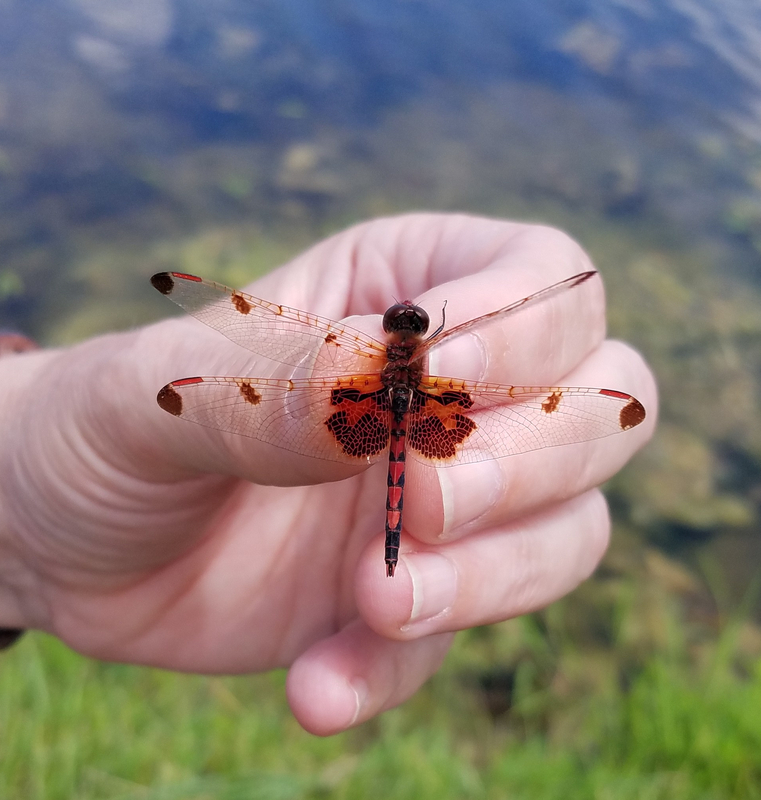 I’d convinced my friend Ryan to go along this year and was looking forward to seeing his reaction to being around so many other odonata afficionados. The location for this year’s conference was the Oakwoods Nature Preserve in Findlay, Ohio. It was nice to have the conference in our corner of the state this time, although our weather forecast was not very good for the weekend — we were supposed to have scattered thunderstorms and overcast skies Friday and Saturday. We spent Friday evening indoors listening to a variety of presentations on topics like the ethics of collecting insects, identification tips, and photography techniques. 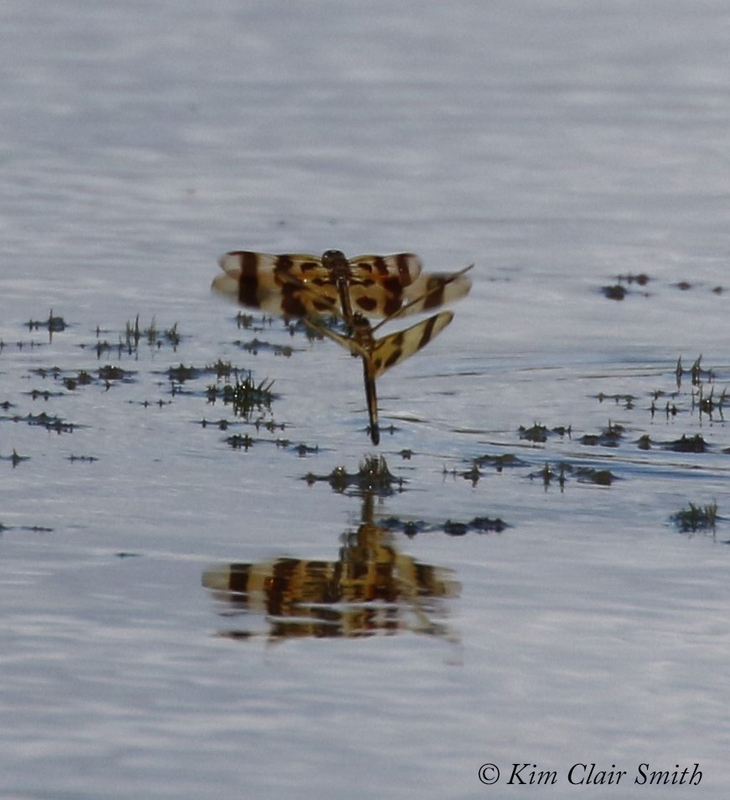 Whereas birders can report their birds to eBird without photos, our dragonfly survey requires photographic evidence of each species, making it very important to know the best ways to get those photos. The photography panel discussion included Judy Semroc and my friends Rick Nirschl and Jim McCormac, each with their own expertise and suggestions for the equipment and techniques that work best for them. It was a great discussion and I came away with some good notes. 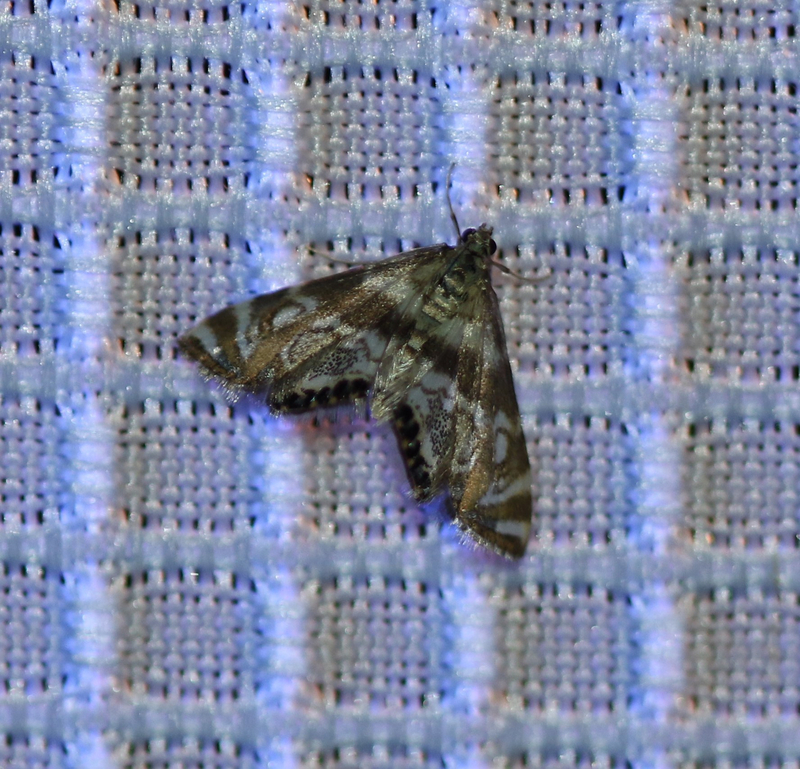 Friday night after dark, they hung out sheets and lights to attract moths, and I enjoyed seeing some new moths and poking around in the woods with flashlights trying to find caterpillars. Saturday morning was also filled with more interesting presentations and time for socializing. And, in a stroke of good fortune, the weather cooperated for our afternoon field trips after all. My trip was to a spot that sounds unappealing — the Hancock County dump. But this property has some amazing ponds and meadows, and we couldn’t even see (or smell) the actual landfill part of it while we were there. And my gosh, were there lots of great odes there! Our group of about ten people was led by Linda Gilbert and Jim McCormac, and they showed us a grand time for about four hours, turning up about two dozen species of odes. One of the best finds of the day happened in the first 20 minutes of our outing, but we didn’t know what it was until the end of the afternoon when we pulled out my field guide and looked it up. It was a Mocha Emerald, a brand new species for me, and a very impressively-sized one too. We watched it flying over our heads for several minutes, until it finally landed on some vegetation along the path and we were able to creep up slowly and get some photos. A little while later we made our way to the first pond, where we found lots of species flying. There were many pairs of Halloween Pennants “in tandem,” which is how we describe their mating position when the male is clasping the female behind her head. In the photo above they’ve already fertilized the eggs and he’s holding on to her while she dips her abdomen in the pond to deposit them. His goal is to make sure no other male interrupts her before she’s finished the job. We found this female baskettail species (below) hanging in the meadow as she began releasing fertilized eggs from the end of her abdomen. We watched as the egg clusters got bigger and bigger, and finally she flew off over the adjacent pond and deposited them in the water. We can’t be positive about her species because we can’t see the terminal appendages with all those eggs covering them, but most likely this was a Common Baskettail (Epitheca cynosura). We came to another pond that had just a narrow area of shoreline access, where our entire group couldn’t spread out at the same time. So our always-prepared leader went into the pond with a net to catch some specimens for us to examine on shore. I think he was having the most fun here, as the rest of us were getting eaten alive by mosquitoes in this particular area. But it was worth it, because he brought us some beautiful insects to see. Jim is really in his element here, wading in the pond to net some bugs for us to examine. For example, here’s a damselfly he netted, being held by our other leader, Linda Gilbert. 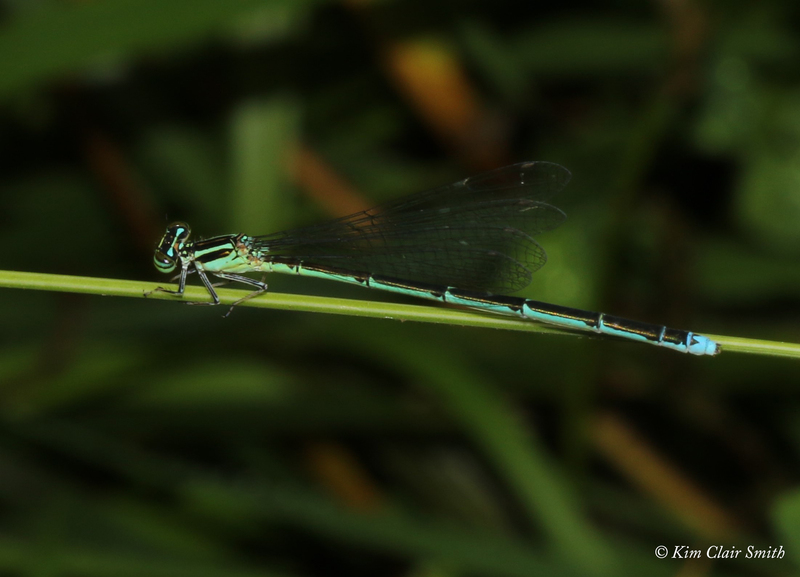 This one is an Elegant Spreadwing (Lestes inaequalis). In case you’re wondering, all of the insects we netted today were released unharmed after only a couple minutes. 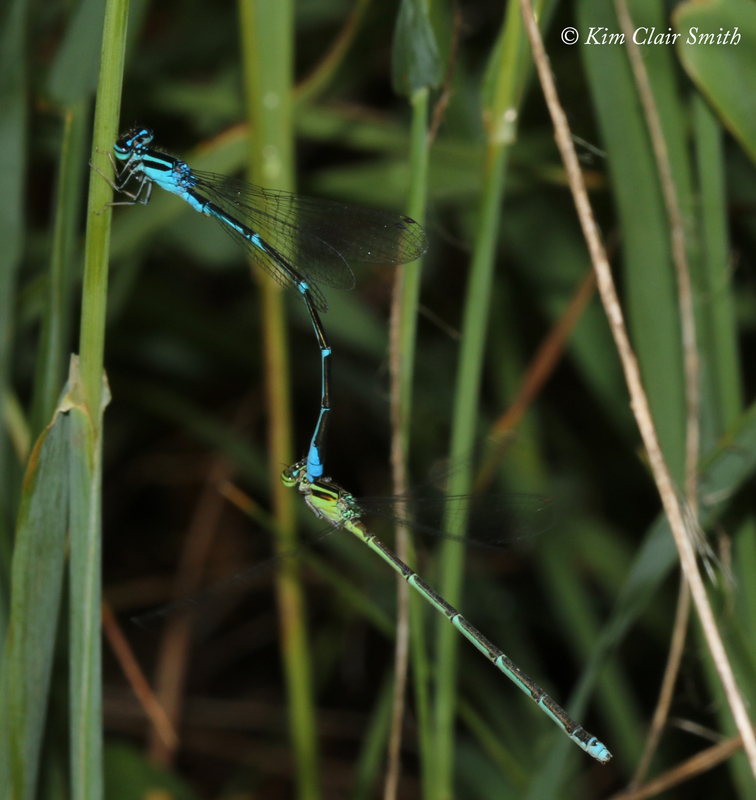 Spreadwings are a group of damselflies that are easy to distinguish from other damsels because of their habit of holding their wings partially outspread when perched. And many of them have beautiful metallic green coloration, like little winged jewels. I love them, even though many of them are frustratingly difficult to identify to the species level. 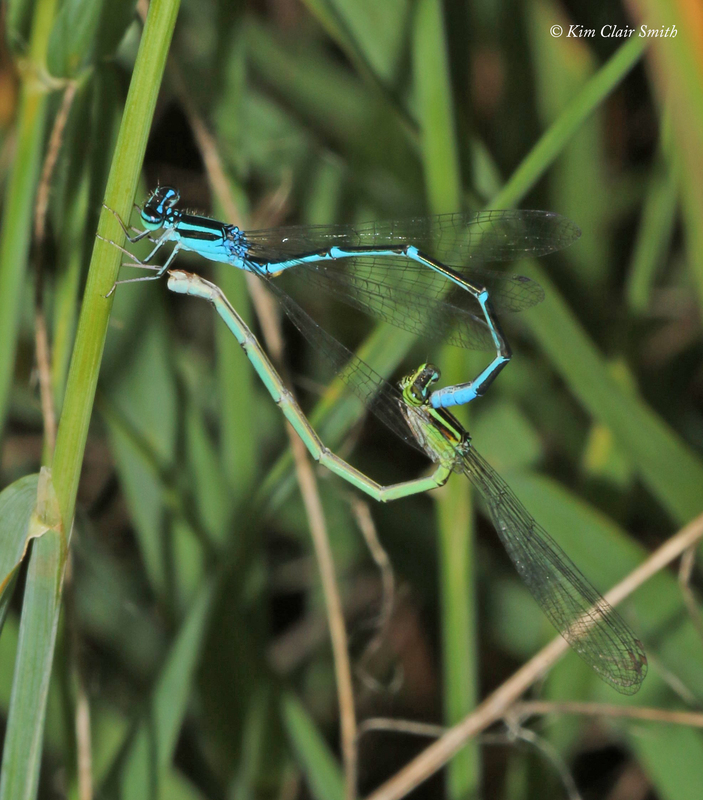 I’ll finish this installment with a few pics of an amorous pair of Stream Bluets that I photographed during a break between presentations at the Oakwoods Nature Preserve. First, the unsuspecting female just hanging out, minding her own business. Next thing she knows, this guy grabs her by the back of her neck. Not much she can do about it at this point, but it all seemed to work out, as seen below as they form the “heart” shape when she reaches her abdomen up to obtain a sperm packet from the male to fertilize her eggs. 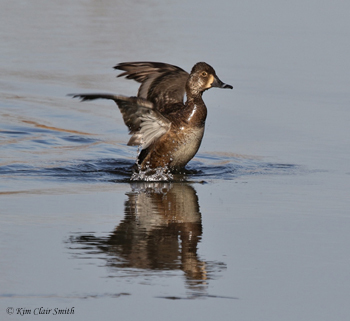 When they’re done with this part, she’ll oviposit into the vegetation in or near the water so their offspring can live in the water until they’re ready to emerge as these awesome winged creatures. There’s much more to tell about our post-conference dragon hunting on Sunday, but I’ll save that for the next post. Suffice it to say that this was a fascinating weekend spent with naturalists and scientists, and I’m already looking forward to Odo-Con 2019. The only question is, how many more of my friends can I get hooked on odes before then? 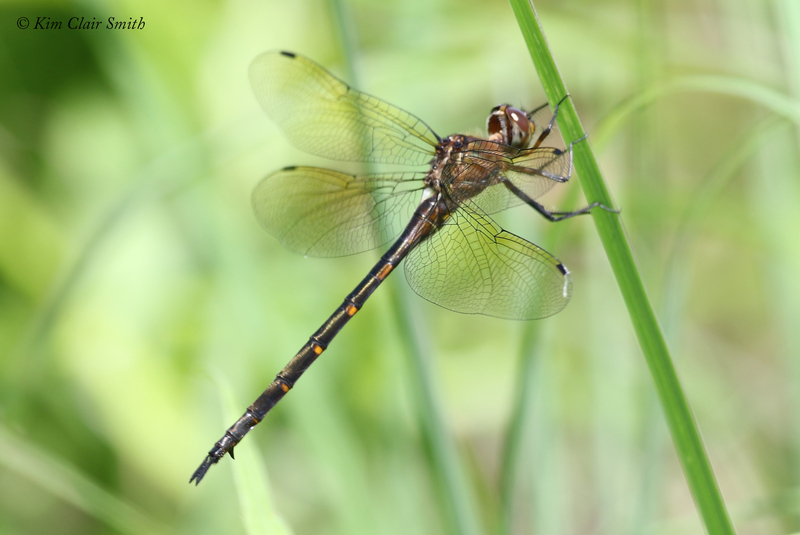 This entry was posted in Insects and tagged damselflies, dragonflies, lifelong learning, odo-con, odonata, Ohio Odonata Society. Bookmark the permalink. Hi Kim, I have been seeing a particular species around my yard and was immediately thinking of you…..knowing you could identify it! I am fascinated by your weekend and writings. I had no idea there were so many species, especially around here…I look forward to your future updates! Never before meeting you in Pottery did I even think about the extent of studying one could do…I am all about it now..thanks to you!!! I’ve seen the mating process near the old river channel (which still has an ample water supply) and also the slough this year. It’s always an amazing thing to stop and observe. I’m not sure many people take the time to educate themselves as you do, Kim. Thank you for sharing your knowledge with us… it’s fascinating!! Thanks, Lori! I was just thinking that I felt like I didn’t explain enough in this post, and might add more information about their lives next time instead of just showing photos. But I agree, they are really fascinating insects.